Hundreds of barrels worth of oil flood 25 miles downstream in Montana river as ExxonMobile pipeline springs leak beneath riverbed. 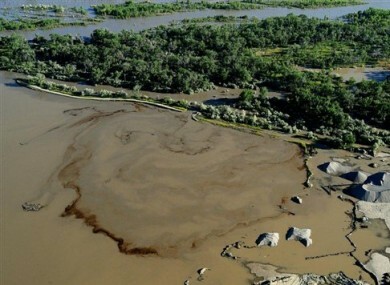 Oil swirls in a flooded gravel pit in Lockwood, Montana after crude oil pipeline ruptures in river. HUNDREDS OF BARRELS of crude oil have spilled into Montana’s Yellowstone River after an ExxonMobil pipeline ruptured beneath the riverbed. The rupture sent a plume of oil 25 miles downstream and is forcing temporary evacuations, officials told Associated Press. The break near Billings in south-central Montana fouled the riverbank and forced municipalities and irrigation districts to close intakes yesterday. The parties responsible will restore the Yellowstone River. Whosever pipeline it is better be knocking on my door soon and explaining how they’re going to clean it up. They say they’ve got it capped off. I’m not so sure. He said about 140 people in the Laurel area were evacuated early Saturday due to concerns about possible explosions and the overpowering fumes. He said they were allowed to return at about 4 am after fumes had decreased. In a statement, ExxonMobil said it was sending a team to help with cleanup, and that state and federal authorities had been alerted to the spill. The ExxonMobil Pipeline Company “deeply regrets this release,” it said. Nobody’s been able to lay their eyes on the pipe. Right now, the Yellowstone River is at flood stage. The bank isn’t stable enough for anybody to get close. The cause of the rupture in the pipe carrying crude oil from Belfry, Montana, to the company’s refinery in Billings wasn’t known. Peters and Malek said speculation involves high water that might have gouged out the river bed and exposed the pipe, which was possibly hit by debris. “I haven’t seen it this high for at least 15 years,” Peters said. “That was the farthest my flashlight would reach,” he said. Email “Crude oil spills into Yellowstone River after pipe rupture”. Feedback on “Crude oil spills into Yellowstone River after pipe rupture”.